Everyone loves a good ghost story. Who doesn't? OK, I know of some friends who dislike listening to ghost stories. If you happen to dislike ghost stories, then you can stop reading and go somewhere else. But I do hope that you will continue reading because what I am going to tell you is not a ghost story. Well, not really. 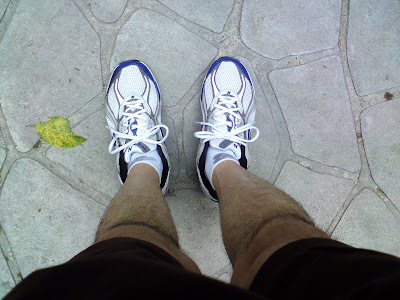 If you have been following my blog, you would most probably know by now that I like to go jogging in the parks. 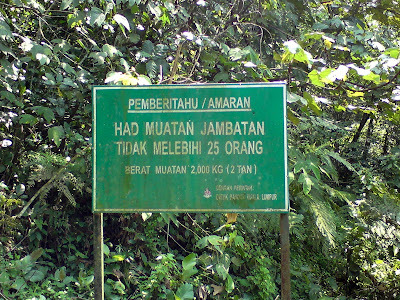 And one particular park I frequent is the Taman Lembah Kiara in Taman Tun Dr Ismail. As I don't like to jog when the park is crowded with people, I normally choose either late mornings or early evenings to do my jog. To me the less people, the better. I can enjoy my exercise without getting interrupted by screaming kids and people talking loudly. 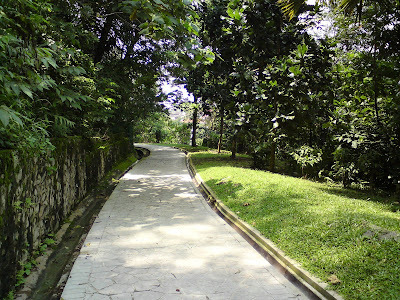 Well, a few months back, I went to the Kiara park for my usual jogging routine. It was a Sunday and I remember waking up very late as I had a good outing with friends the night before. I think it was almost noon when I reached the park. 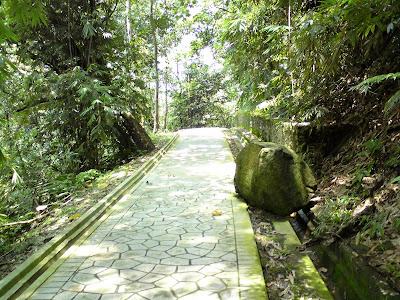 As usual, I would run up the stairs that lead to the jogging trail in the forest. On that particular Sunday, there were not many people around. It could be because it was already noon and people would be having their lunch by then. Who in their right mind would be like me, jogging at that hour? 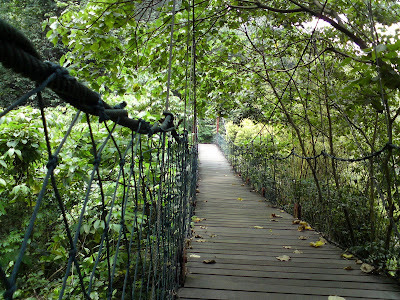 Anyway, as I crossed the suspended bridge and ran along the jogging trail deep into the forest, I noticed how quiet the surroundings were. There was not a human being on sight. No birds chirping, no monkeys playing with each other. Only the rustling of tree leaves and my own breathing were heard. Out of this quietness, suddenly I heard a man's voice singing. I stopped dead on my tracks. Where did the voice come from? I could not see anyone in front or at the back of me. It was a loud, booming voice singing a song that I do not recognise. I could not even identify whether he was singing in English or some other language. The first thought that came to my mind was the voice belonged to a ghost! But I have never heard of a singing ghost! Except a female ghost that sings some sad haunting songs. This one was different. 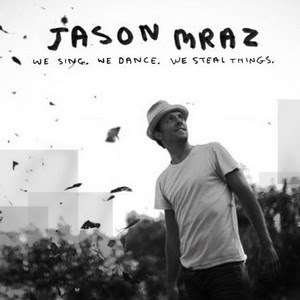 The song was neither sad nor haunting. It sounded like an anthem a soldier would probably sing in the military. Should I turn back or continue ahead? I could feel my heart beating faster. As I was trying to decide, the voice became louder and louder. Then ahead of me, I could see a figure emerging from the forest. It was not very clear, but I imagined it must be a man. I braved myself and decided to walk ahead, although I felt like running away in the other direction! As I walked closer and closer towards the figure, I began to see it was actually a man, somewhat middle aged. He was dressed like a soldier. He saw me and stopped his singing abruptly. We were now within metres of each other. I gave him one quick look and immediately looked away. I did not dare look longer. His face was pleasant enough, not hideous as I so fearfully expected. I was pretty sure he was a Chinese man and I would say he would be somewhere between 45 to 55 years old. I think he looked at me and smiled. I did not know if I imagined it or not, as I was in a state of fear bordering on panic. We walked past each other. I quickened my pace and did not look back! What if he suddenly decided to turn around and tap me on the shoulder? I would surely die! I did not know how long I took but when I came out of the forest only did I notice my hands were shaking and I was sweating like mad! To this day, I do not know why a man would want to dress up like a soldier and sing alone loudly in the forest. It gives me the jitters just thinking about it. I have never bumped into him in my subsequent visits to Taman Lembah Kiara. Nor do I wish to! So was it a man? Or was it a ghost? 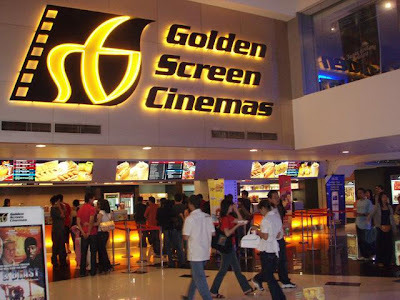 The three movies I watched during the Raya week long holiday break were a Singaporean movie called “Money No Enough 2”, a slasher movie called “Halloween” and an action packed movie called “Eagle Eye”. Which of the 3 movies do you think I enjoyed most? Well, let me describe what I think of them one by one. I shall start with "Halloween". This is a remake of the original 1978 “Halloween” film directed by John Carpenter who also directed one of my favourite movies, “The Thing”. I like a good slasher movie and since the original “Halloween” was such a classic and I have never watched it before, I thought watching the remake would be the next best thing. Since I did not watch the original, I could not do a comparison. But if I had expected it to be as entertaining as “I Know What You Did Last Summer” I was completely wrong! Well, it was violent all right, but that’s about it! There’s really no plot, just endless killings by a mad man by the name of Michael Myers. What I find a bit hard to believe is how Michael was shot three times and still survived and even had the strength to continue his killing rampage. The movie made him inhuman, more like a monster. But the fact is he’s just a mad man and three shots should have killed him! I had high expectation of “Eagle Eye” starring the upcoming young actor, Shia LaBeouf. It was fast action from the beginning till the end. So I must have enjoyed it a lot, didn’t I? Well, surprisingly no. To say that this movie is stretching it too far is an understatement. I find the story filled with so many impossibilities I just lost interest halfway through the show. 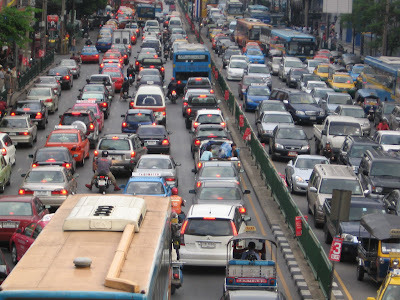 It’s too much to ask me to believe that there’s this computer that could control every mobile phones, every security camera, every traffic lights and to top it off, could give precise driving instructions and control movement of cranes in junkyards. Well, if you can suspend your disbelief and just watch this for the action, you may just enjoy it. As for me, I already lost interest halfway and did not even care whether the hero or heroine dies! By now, you would have probably guessed that of the 3 movies, I enjoyed “Money No Enough 2” most. Yes, that’s right! 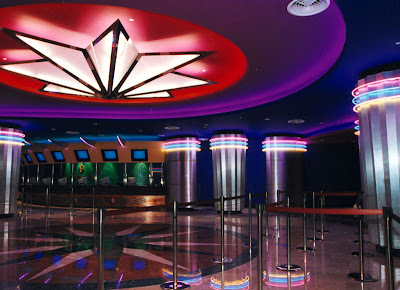 A Singaporean movie just trumped two US movies. 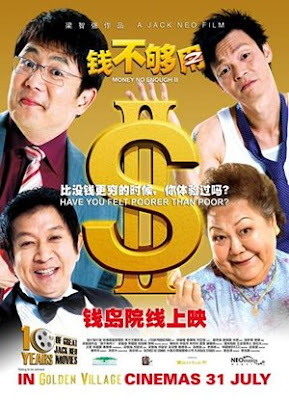 This movie’s central theme is about filial piety and how money is not everything in the world. It also touched on Singaporeans’ dissatisfaction with their Government which was quite interesting. This is the first time I see a movie with so much tears flowing from my eyes, not just from crying but from laughing! It's very entertaining and touching at the same time. 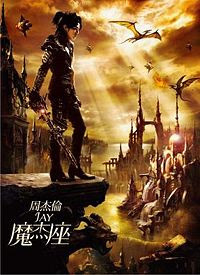 Jack Neo, the director, is definitely a genius! Henry Thia, the comedian actor made me laugh all the time! It's so funny in one court scene when he was asked his IC number and he could not speak out in English but when allowed to say in Hokkien, he shot the numbers out within 1 second. Another funny scene was when Lai Meng who played the mother asked if he had eaten but she asked so many times (I can't remember how many times) I laughed until my tears rolled out! And of course the songs that were sung during those sad moments really pulled at the heart strings. It was really, really touching and I don't care if you are a man or a woman, if you did not cry during those scenes, you must be a very cold blooded person! Either that, or you must be sleeping during those scenes! By the way, did you know that fellow blogger QuaChee had a small part in the show? But it would be hard to spot him because he’s among a group of people in a crowd. Read about it in his blog here. All the eating at Raya open houses and dining at buffets during the Hari Raya week long holidays have taken a toll on me. I pinched my waist and could feel the fat deposited there! Not to mention holidays tend to make me lazy. Too much eating and lack of exercise is undoubtedly, a sure way to gain weight! So the week after the Raya holidays, I went straight back to my usual workouts. Normally I would do some weight lifting and resistance exercises in the gym. My aerobic exercises would be done outside the gym. That’s because I prefer the fresh air and the greeneries outside. Not only that, I heard that we humans need to connect with nature more often. This is because we need to absorb the good hado from nature. Hado is something like life-force energy, similar to what the Chinese call “chi”. If you read my previous post on Messages From The Water, you would know how hado can effect changes in water molecules. A walk in the forests, camping along the streams, or going to the beach will help us receive more good hado. People who live in the city, and work in concrete buildings all the time have greater needs of this good hado. Without which, health would deteriorate and they would easily fall sick. 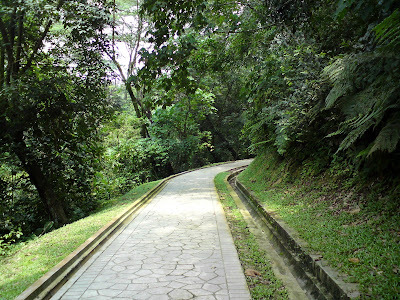 This week, I went to Taman Lembah Kiara at Taman Tun Dr Ismail to do some jogging. 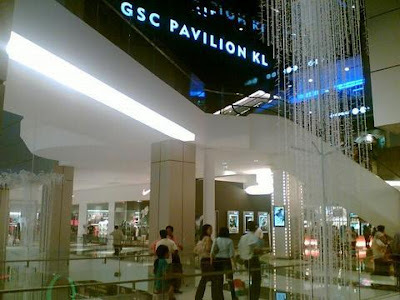 It’s a nice place with a beautiful lake and fountains, a waterfall and vast greeneries. 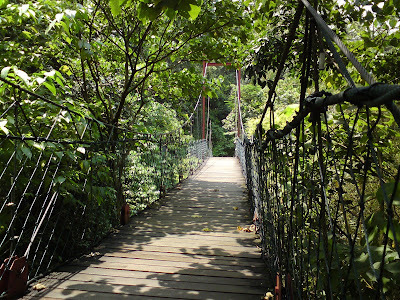 There’s also a suspended bridge and a jogging trail that runs through the forests. 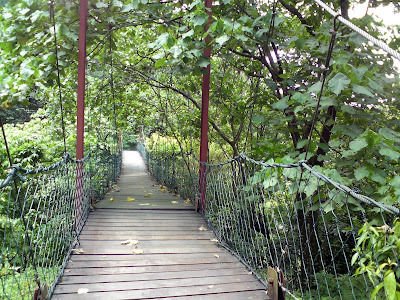 I have mentioned about this nice park in one of my older posts, complete with photos. Read it here. The photos in the older post were taken with my old handphone SE K750i so they did not turn out good, so here are more photos of the park taken with my new SE C902. If you want to lose weight or just to maintain your weight, stop stepping on those treadmills or cross trainers in the gym. Go to the parks and do your aerobic workouts! Besides the fresh air and some doses of healthy sunshine, you will also benefit from absorbing the good hado from the trees and grass around you. Furthermore, listening to the delightful chirping of birds will definitely lift your mood - a sure cure for stress and depression! The very word send shivers down my spine. Did you know that 100 years ago, 1 in 33 people had cancer? Today, it is more than 1 in 3. What does this mean? It means that if there are 3 people in a room, the chances of 1 person in that room getting cancer in his or her lifetime is pretty high. Did you know that every 45 seconds, someone in the world dies from cancer or its treatment? Twenty years ago, 1 out of 25 women had breast cancer. Today, it is 1 out of 8. Since 1955, prostate cancer has risen more than 600%. In the last 20 years, the war on cancer has spent over one Trillion dollars. And lost. My own brother-in-law died of liver cancer last year. When he was diagnosed, he was already at Stage 4 - the last stage, where hopes of surviving are almost zero. Two years back, a friend of mine died from lung cancer. She initially had an operation which cut off part of her lungs. It did not help. The cancer spread to her neck, then to her brain. By the time she died, she already lost her eyesight due to the ravages of the dreaded disease. It's scary. There is no cure. No one is immune. But why? Why do people get cancer? Why do more and more people get cancer nowadays compared to 20 or 50 years ago? Something must be wrong somewhere. Some things must have changed. I am going to get to the bottom of what causes cancer in my future posts, and how we can prevent it from occuring. If medical sciences have no answer to cancer, the least we could do is to try to prevent it from happening in the first place. Meantime, let us all just stand up to cancer. Let us help those who are suffering from it. Watch this performance by Beyonce, Carrie Underwood, Mariah Carey, Mary J. Blige, Rihanna, Fergie, Nicole Scherzinger, Natasha Bedingfield, Miley Cyrus, Leona Lewis, Keyshia Cole, Ashanti and Ciara. Or for a more clearer video, go here. Visit Stand Up To Cancer website for details. After the death of my brother-in-law and my friend, I have always been touched by the sufferings of cancer patients. I have since then made a commitment to at least help ease their financial burden by donating to MAKNA (National Cancer Council) on a monthly basis. If you like to donate or join the Direct Debit Donor Program, please log on to MAKNA website for more details. Your donation will be very helpful to those in need. Furthermore, it's tax exempted. So let's help these cancer victims and may God bless you. 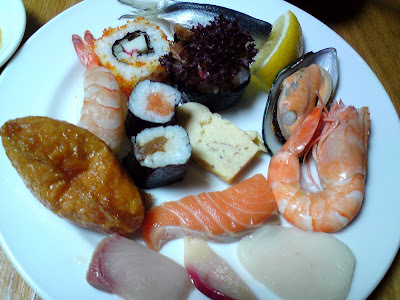 After an enjoyable buffet lunch at Lemon Garden Cafe in Shangri-La Hotel KL on Monday last week, my friend and I returned to the hotel last Saturday for Japanese buffet at Zipangu. If you have not been following my blog, do read about my previous post on Lemon Garden Cafe. We initially wanted to try the buffet dim sum at Shang Palace as friends have commented their dim sum are nice but a call to Shang Palace confirmed that there would be no dim sum buffet available for that day. In case you think I must be bloody rich to be dining at such expensive places twice in a week, let me assure you I am only doing so since my friend had the Shangri-La privilege card which entitled her and her guest to 50% discount on all dining in any restaurants in the hotel. OK, back to the topic at hand. 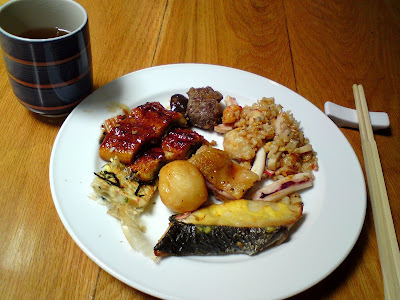 The buffet lunch at Zipangu started at 11.30am. We arrived there at 11.30am sharp. Already there were a few early birds there, and I thought we were the earliest! 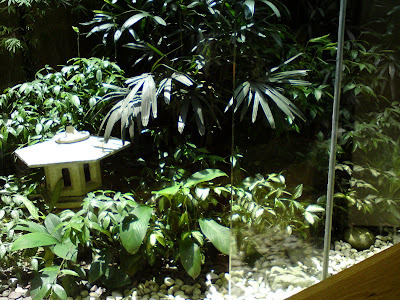 We were led to our table for two which had a nice view of a fake mini Japanese garden outside. But as the afternoon set in, we had to request for another table because the sun was shining at our table and it was getting hot! We actually asked the waiter to lower the blinds but guess what? They were not real blinds, so they could not be lowered! So move to the next table we did! The first thing I ate was unagi. I love unagi and I knew how expensive they were. And I could eat as much unagi here as I wanted! Wonderful! I also had beef, fried rice with squids, fish, chicken and something that looks like a fish ball. Next, I went for my favourite sushi and sashimi. I did not try their oysters as they were small and did not look fresh. It was a far cry from the very juicy and delicious looking oysters I had at Lemon Garden Cafe! My friend did not really like raw food and she joked that to kill off all those worms in the sashimi, she asked me to drink some hot soup right after eating them! I was like, yeah, as if that would work! Anyway, there were huge varieties of soups available and I chose this kimchi hotpot with codfish. It tasted a bit sourish and the codfish was nice. But I think I still prefer Chinese soups. I do think Chinese people make better soups compared to the Japanese. 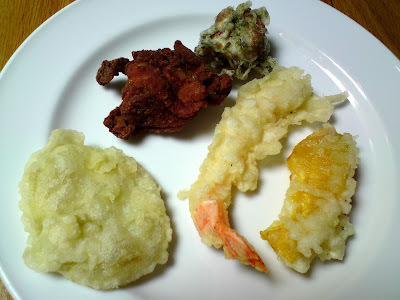 Next, we went for the tempura. I don't really fancy fried things simply because I think they are pretty unhealthy with all those trans fat. But I thought the fried pumpkin (right side of photo) was rather nice. 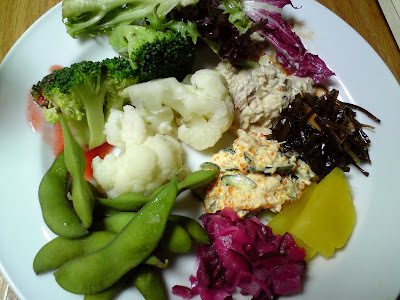 After that, we went for the Japanese salad. Do you see the Japanese soy beans or popularly known as edamame in the photo? They are my absolute favourites! I ate tons and tons of these beans! If I recall correctly, one plate of edamame in Sushi King taken from the kaiten belt cost RM4. I think the amount of edamame beans I ate that day was equivalent to more than 4 Sushi King plates! By then , I was already too full to try the Japanese noodles. I was really quite surprised at myself. Normally, I would be able to eat some more, but somehow on that day, I felt full already. Maybe it's too much of the fibres from the edamame beans! Or maybe lunch was just too early at 11.30am. Well, full or not, there must still be some space left for the desserts! 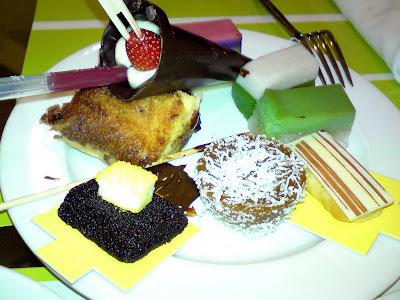 I never ever miss desserts at any buffet. 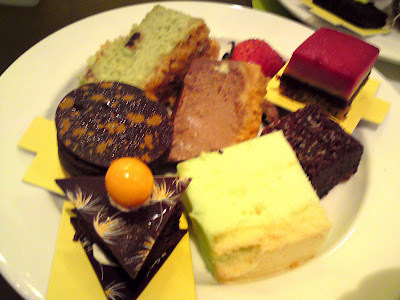 Going to a buffet and not eating the desserts is like not going to a buffet at all! Blame it on my sweet tooth! This being a Japanese buffet, I am not going to miss the mochis! The purple and green mochi (or is it called omochi?) is a must-eat. The other desserts were the normal cakes and local kueh. I was quite surprised they did not have Japanese green tea ice cream! I would have thought a Japanese buffet should at least include that! Well, it was nevertheless, quite a satisfying meal. And I sort of like the nice relaxing ambience there. It was certainly a high class dining experience with tables all spread quite far apart from each other so that it felt spacious. No noisy "pasar" environment you normally find in Chinese dining restaurants. The bill came up to about RM55 for each person after the 50% discount, which was definitely worth it. It was miles better than Shogun which cost about RM60. By the way, I will never go to eat at Shogun in 1Utama ever again - their food is horrible! I think my next Japanese dining will be either at Rakuzen or Jogoya. Too bad Jogoya is so terribly popular they refuse to offer any promotion or discounts! Maybe we food lovers should co-operate and stop going to Jogoya for a month or two and see if they will consider reducing their price! Haha! I've just bought myself a new hand phone. 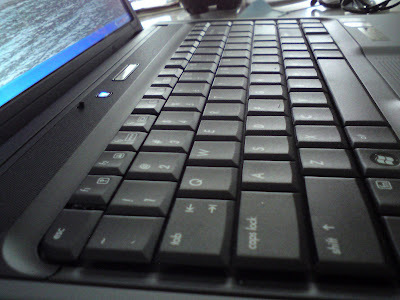 So I would like to blog about it today. 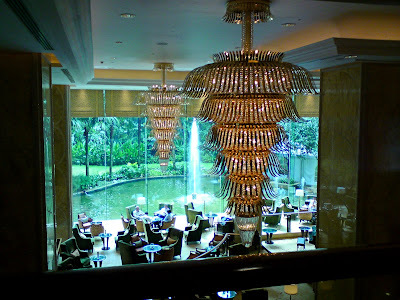 Now, for those of you who are waiting to read where my friend and I went for our next dining in Shangri-La Hotel (read my previous post if you are clueless), I apologize as I have to put that post on hold. My old Sony Ericsson K750i had problems taking nice photos which I wanted to upload to my blog. Besides, I was getting really irritated with its joystick which get spoilt easily. I have changed the joystick twice before and each time, it worked nicely for about six months before it started to give me problems. So for my next phone, I was looking for a good camera phone which can take decent pictures. I know I should get a real camera instead, but I hated the idea of carrying too many things while on the go. 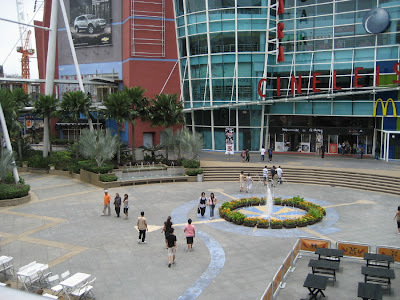 Since I carry my handphone wherever I go, a camera handphone would be ideal. Also, I would never again choose a phone with joystick . No way! A navigation button would be perfect and would not give me problems a joystick would. The question was, with all the brands out there, which camera phone to choose from? Well, it was not that difficult for me to decide. You see, I only go for Sony Ericsson phones. 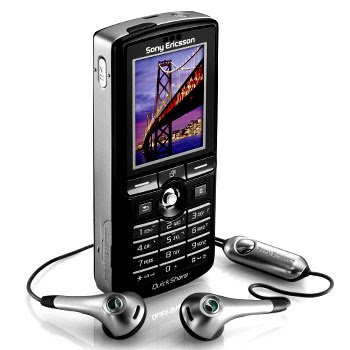 In my opinion, Sony Ericsson is better than Nokia and Samsung. 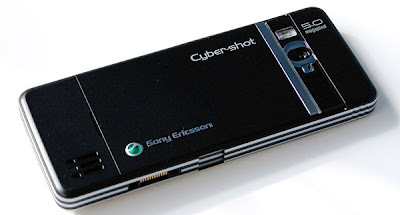 You can say I'm a big fan and loyalist of Sony Ericsson. 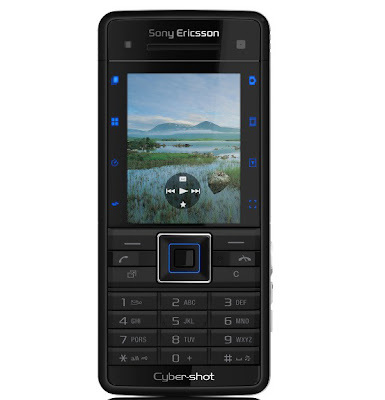 So what is the best Sony Ericsson camera phone in the market right now? I don't know what that will be two months from now, but at the moment it is none other than SE C902. Take a look at the C902. Doesn't it look good? It has 8 touch sensitive camera shortcuts that I like! Although the touch screen at the sides may make the main screen appears a little smaller, it is still bigger than my previous K750i. OK, perhaps it does not have the trendiest of style, but I'm already very satisfied with the phone. 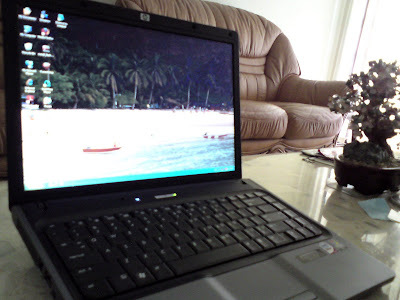 It's very sturdily built and has a very good quality feel about it. No need to be so trendy for me. 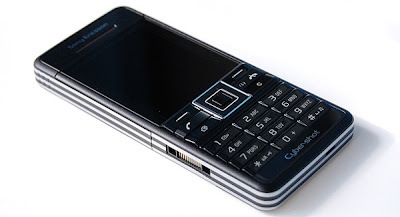 Anyway, it's a cool phone as I heard that James Bond is using the C902 handphone in the latest Bond movie "Quantum Of Solace". Cannot be that bad, yes? I also like the way you slide the phone open to reveal the camera lens. Looks very impressive to me! 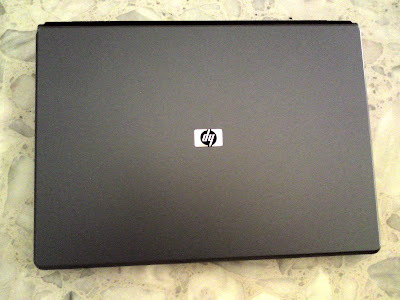 And it comes with 5 megapixel so the photos taken turn out to be quite good, I should say. Of course you can't compare it to a proper camera, but as camera phone, I think this is one of the best if not the best! 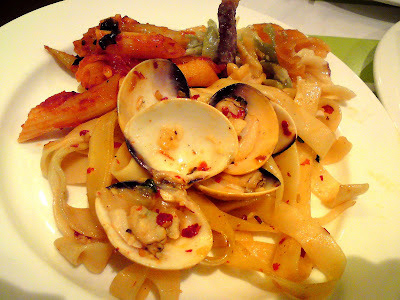 The photos of my buffet at Shangri-La in my previous post were taken with this handphone. Here are more photos of Shangri-La taken with the C902. 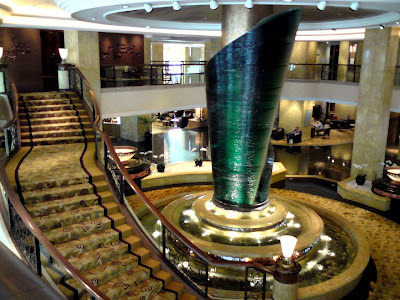 The lobby at Shangri-La Hotel KL. Don't this remind you of the Beijing Olympic torch? 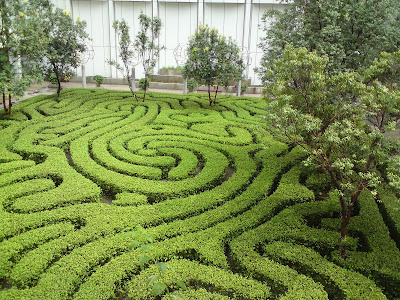 The garden maze at Shangri-La. 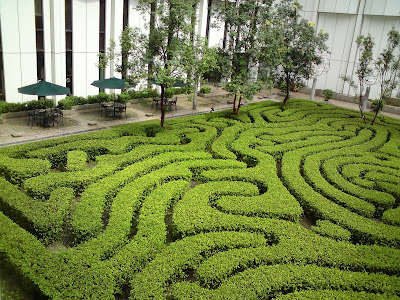 Another photo of the garden. The view of the hotel lounge from the 1st floor. I find the phonebook absolutely user friendly. When you want to call someone and you just key in part of the number, the phone will list out all possible contacts with part of the numbers you just keyed in. As for texting or sms, I love it to bits! The T9 dictionary is excellent to use, with the prediction of the word you are likely to use suggested to you before you type the next word. As for the battery, it can last for up to 4 days with general use. This to me, is considered a very good battery performance. Oh, if you want to use this phone as your MP3 player, you will be pleased to know that music from this phone is of very good quality! And with 8GB memory card, you can store thousands and thousands of your favourite songs! Simply smashing! There are however, a few downsides for this phone. Firstly, there is no GPS which is funny because it has Google Maps. Guess you would have to get an external GPS. Secondly, there is also no WLAN support for this phone. Thirdly, the camera does not seem to work very well in poorly lit conditions. But overall, it's a great phone to me at least, because it fulfilled my criteria of a good camera handphone, with no joystick, but with excellent phonebook and sms features, and excellent music player too. For those of you who can't wait to find out where my friend and I went for our next dining at Shangri-La, don't miss my next post coming right up! 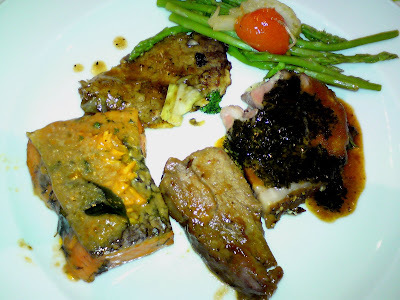 Last Monday, I went for a buffet lunch at Lemon Garden Cafe in Shangri-La Hotel KL. I was really looking forward to this lunch because of 3 reasons. 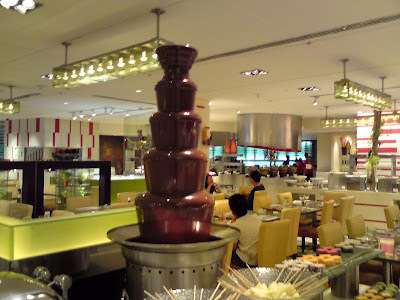 Reason 1 - I heard the buffet here is one of the best in KL. Reason 2 - I am meeting up with a friend whom I haven't talked to for quite some time. Reason 3 - My friend has the Shangri-La member privilege card which entitle the member and his or her guest to 50% discount at any restaurants in the hotel. Well, actually she is not a member, she just borrowed the card from her friend! Anyway, it proved to be a really enjoyable and mouth watering lunch! I've eaten buffet meals at many hotels and I don't think most of them had the kind of quality and variety of food that Shangri-La offers. But then again, the price was not cheap at RM89.90 nett per person. And I am only talking about lunch. Dinner was priced at around RM120 during Ramadan month! Of course, I only paid RM45 since we got to enjoy the 50% discount. Here are some of the photos of the food we both ate. We started off with some Chinese cuisines. 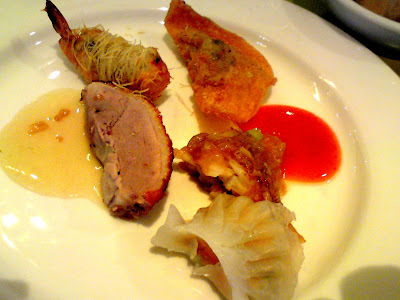 There's the lovely duck with plum sauce, fried prawn, fried wantan, chicken and prawn dumplings (har gao). There were other dimsum food like siew mai and pau which I decided to forego as they were not exactly my favourites. 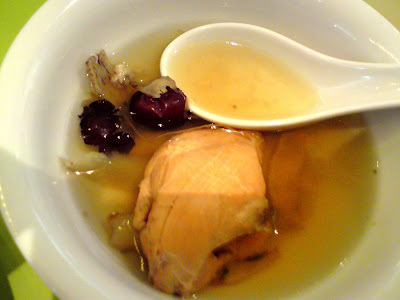 We also tried this herbal chicken soup which was very tasty! I wanted to go for second round but then decided not to as I wanted to leave space in my stomach for other food! 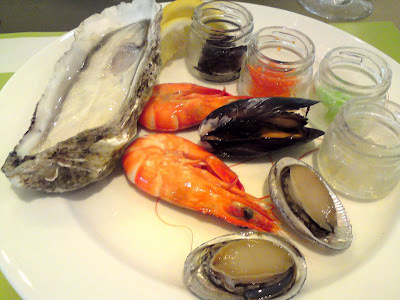 Next, I had this very huge raw oyster which was very fresh. Digging my spoon into the shell was like digging into a bowl of tau foo fah - the meat was smooth and so juicy! If you like oysters, this is the place to go to! Their oysters were very fresh and best of all, they were huge! Not like those small ones you find in other buffet spreads. Believe it or not, they also had abalones, although they were mini abalones (bottom right of photo). I am not a big fan of abalone, but knowing how expensive abalone is, it would be a waste not to eat it! 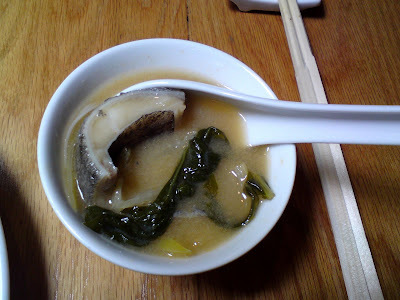 Anyway, the mini abalones were not really that good, perhaps it was not prepared the way abalones were usually prepared. There were the usual fresh prawns and clams. But one thing which was missing and which my friend complained was mussels. She preferred mussels to oysters, but not me. Oysters were nicer and tastier, at least to me. I actually ate a few more of those delicious oysters! In fact, if you go to this buffet and just eat all the oysters you can eat, it is already worth your money! If you notice the 4 bottles in the photo above, and wonder what is inside them, well, they are actually caviar. The black stuff was sturgeon caviar, the reddish was salmon caviar, the green was wasabi caviar (this is the one I liked best!) and the last one was apple caviar, which was not really caviar. Actually I had no idea what it was, but I didn't like it! There were lots of sushi but I did not bother. Instead I went for the lamb, beef and salmon with asparagus and tomato thrown in. The lamb meat was excellent especially when dipped into the mint sauce! My friend told me the wild mushroom soup is to die for! So how could I not try it? But after taking a sip, I found it to be ok, certainly not to die for. 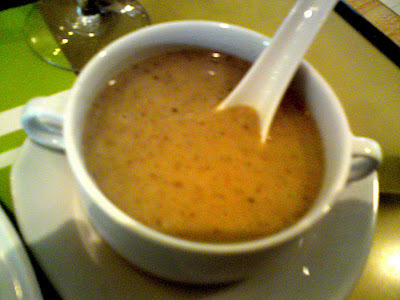 When my friend took a sip, she realised it was not the same mushroom soup she had before. Too bad! Next, I went for the satay. 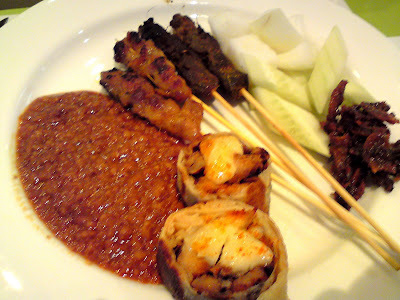 Quite good, though the peanut sauce still could not match the one from famous Satay Kajang Haji Samuri. Don't ask me what are those circular objects at the bottom of the photo. All I know is it's chicken meat wrapped in a thin skin of something, which I have no idea whatsoever. They were quite tasty, though. While my friend went for the western salads, I decided to go for my pasta fix. This one was delicious with lots of clams! Yummy! After that, it's time for desserts! When I first stepped into Lemon Garden Cafe, I was taken in by their very tall chocolate fountain and could not resist taking a snap of it. Look at how tall it is! 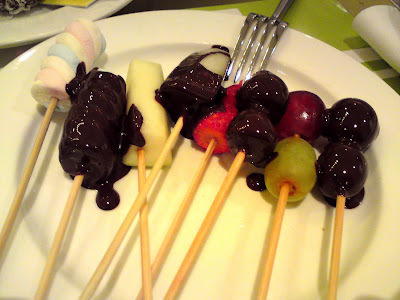 And so, I dipped in some strawberries, grapes, honeydew and marshmallows into the chocolate fondue. Actually, I didn't dip all because I prefer to eat those fruits without the chocolate. The marshmallows and chocolate however were a good mix. Time passed really fast. The buffet lunch started at 12pm and was supposed to end at 2.30pm. I didn't even realize it was near closing time when one of the staff reminded us that we only have 5 minutes left before last call! My goodness! However, the staff was very nice. He asked us to take as many food as possible to our table as we could still eat them after closing time. Nice chap...and so we took his advice. Look at what we took back to our table. 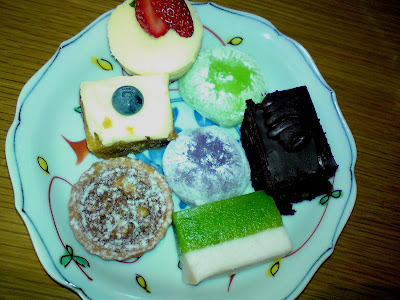 An assortment of cakes and local kueh and we only managed to take half of the different varieties that they have! I liked the kueh talam (green kueh with white layer on top) best! Of course I did not finish them all, I could not take in so much at one go and had to share them with my friend. Now no buffet can end without a sample of ice cream, right? So besides taking all those cakes and kueh in that last 5 minutes, we had to rush to the ice cream counter to get our ice creams too! 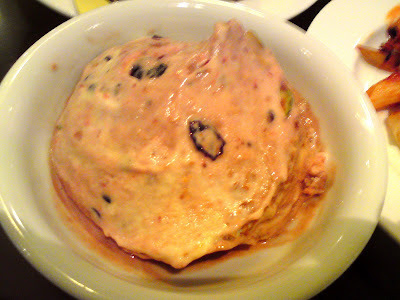 The result of the mixed up ice cream looks like this. My friend said it looked like cow dung. Haha! I had to agree especially if it was darker. If I had only used chocolate flavour, it would surely looked exactly like cow dung! But I swear it was delicious. I regretted not putting in more pistachio nuts because that really made it very nice! This was certainly one of the best lunch I had! Shangri-La really lived up to my expectations. And another thing I like about it is the staffs at the Lemon Garden Cafe. They were so helpful and kind and even joked with us. I would say the service was first rate! I would definitely come back again for more! Now since my friend did not have to return the Shangri-La member card until next week, guess what? We could come back for another round of buffet! 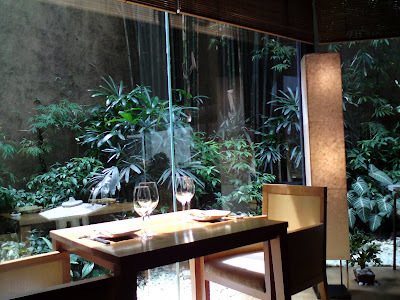 Or should we try other famous but expensive restaurants in this five-star hotel, like Shang Palace and Zipangu? Well, to know what we did, you will just have to wait for my next post!